What’s happening in mining states and which administrations are debtors choosing? In mid-January, the Australian Financial Security Authority released the personal insolvency statistics for the final quarter of 2016—giving us the chance to dig into the numbers on both a quarterly and annual basis. In the December quarter, the number of personal insolvency administrations continued the trend for 2016 by once again increasing. The year-on-year comparison of the September quarter shows modest growth of 0.9%. When we look at the stats for the entire year of 2016, the conclusion is that it has been a growth year for personal insolvency with an overall increase in total appointments of 4.3%—the largest increase since 2009 when the Global Financial Crisis spurred personal insolvencies to record levels. We’ve been discussing two major trends in the personal insolvency numbers all year. First, the strong increases in personal insolvency activity in the ‘mining states’ of the Northern Territory, Queensland, and Western Australia. 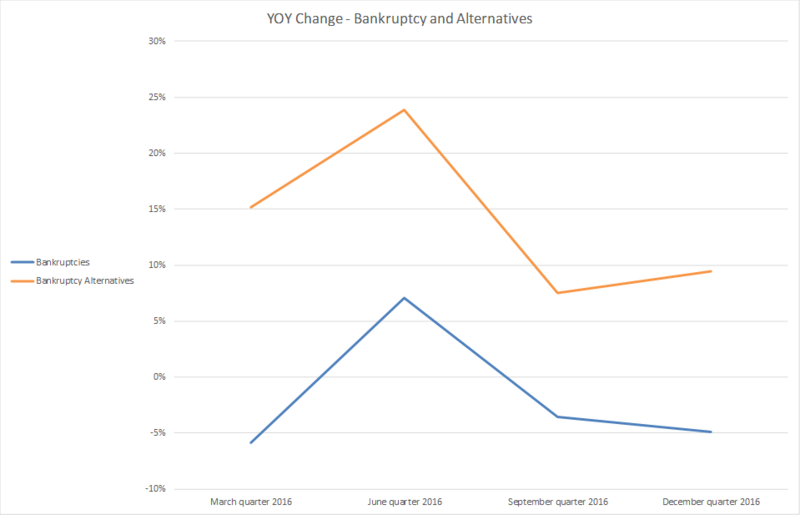 Second, the increasing popularity of alternatives to bankruptcy. 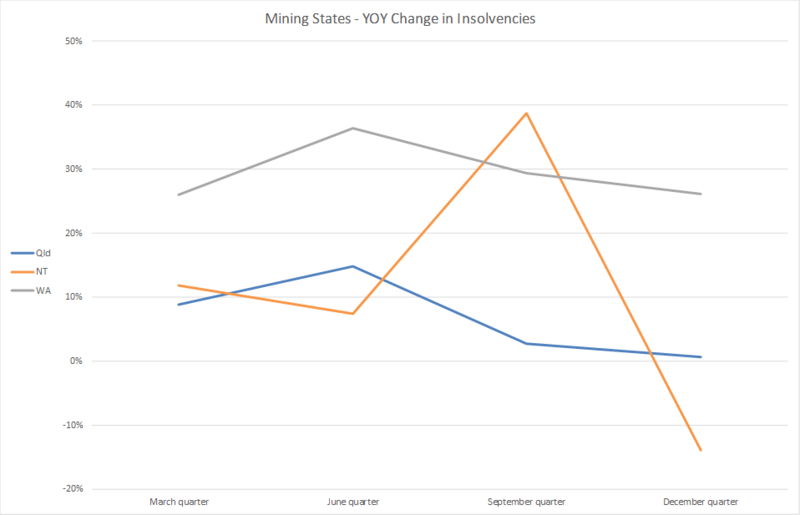 While both trends have continued, the growth in personal insolvencies in ‘mining states’ now appears to be easing. This is especially evident in Queensland and the Northern Territory; while the slowing down of the growth rate in Western Australia appears to be happening a lot more gradually and as such, this state still exhibits a significant jump in personal insolvency numbers. Debt agreements continued their strong growth at the expense of bankruptcies so while the total number of personal insolvencies grew this quarter, there was a fall in the number of bankruptcies. Debtors continue to choose alternatives to bankruptcy (debt agreements and personal insolvency agreements). Apart from a brief respite in the June quarter, bankruptcies have fallen every quarter this year, while alternatives to bankruptcy have recorded strong growth every quarter. Looking ahead, the prospects for the Australian economy appear restrained and there are still no obvious signs of a significant recovery in the mining sector. 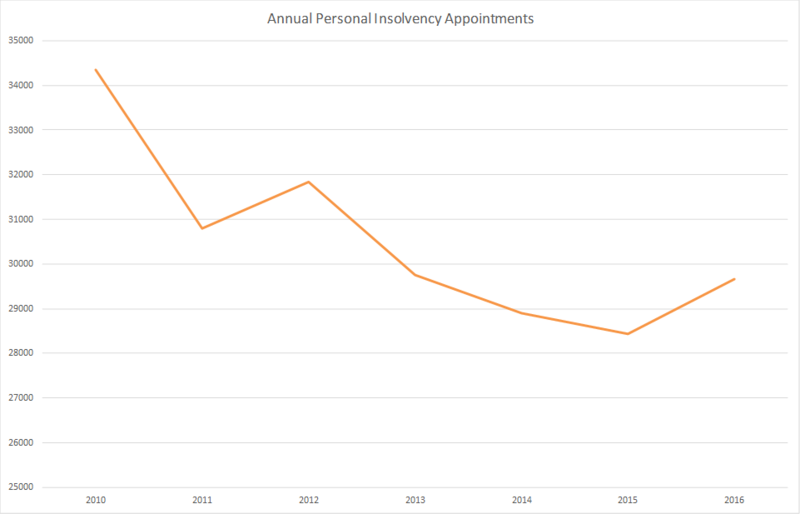 With circumstances remaining largely the same, we expect personal insolvency appointments to continue their current trend of slow, but steady growth in 2017.